I’m back! I finished Simplicity Threads 2591 today. Remember how I said I wasn’t sure if what I did was right with the pockets etc? Well, I ended up unpicking it. It just didn’t sit right. I also had a bit of a glitch with the straps. Once again I had difficulty with the instructions and as a consequence I accidentally caught the straps in a seam that they weren’t supposed to be sewn into! This kind of thing just goes to show how important it is to make a toile/muslin first, then at least when you’re using your precious fabric, you know exactly what you’re doing with it and how it is supposed to look! Anyway, I’m pleased with this dress. It’s a nice, comfortable fit, and there is no strain on any of the seams or the zip. These days I can’t bear to squeeze myself into tight dresses, and I think it’s more flattering to wear something with a bit of ease. I’d like to use this pattern again, but I think I’d choose a different view next time. I like view D, but also fancy A and B! I would recommend the pattern to other sewing enthusiasts, but with a warning to take your time and make a toile first, as some of the instructions are quite difficult to follow and the diagrams aren’t always as helpful as they could be. Thank you to my in-laws for the fabric, and to Julia for the pattern! Last night whilst watching TV I did a bit of extra work. I traced out my next pattern – the lovely Parfait dress by Colette – so that I’d be ready to cut the fabric today. These are the stages of sewing that I find tedious, and I have a tendency to rush because I’m so impatient and annoyed that I have to do it, so I knew it’d be a good idea to do it whilst watching TV to take my mind off the task in hand, and also so I could start doing the actual sewing sooner. Today I spent more than two hours cutting the fabric, interfacing and transferring the markings. All I need to do is sew the interfacing on and then I’ll be ready to begin the contruction of the garment. Me: You know this interfacing….? I’m starting to get a bit jittery now about my City and Guilds deadline, which is on Monday! Eek! Since I started my City and Guilds course, Mr Tweedie and I have had an arrangement whereby on the weekends that we are at home, I can have Sunday as my ‘work’ day, and he will spend the day with Little Tweedie. Today was one of those days. In addition to this, as a one-off, I also have tomorrow completely to myself, as Mr T is travelling to see some friends and is taking Little T with him. (Originally it was supposed to be a family day out, but then I found out my C&G hand in date was the same day). So, today I woke up knowing I had two full days to finish off my C&G coursework and to do a bit of sewing. I spent the morning organising all the work I’ve done so far, and I began to realise just how many loose ends there were to tie up, and that’s when I started to panic. 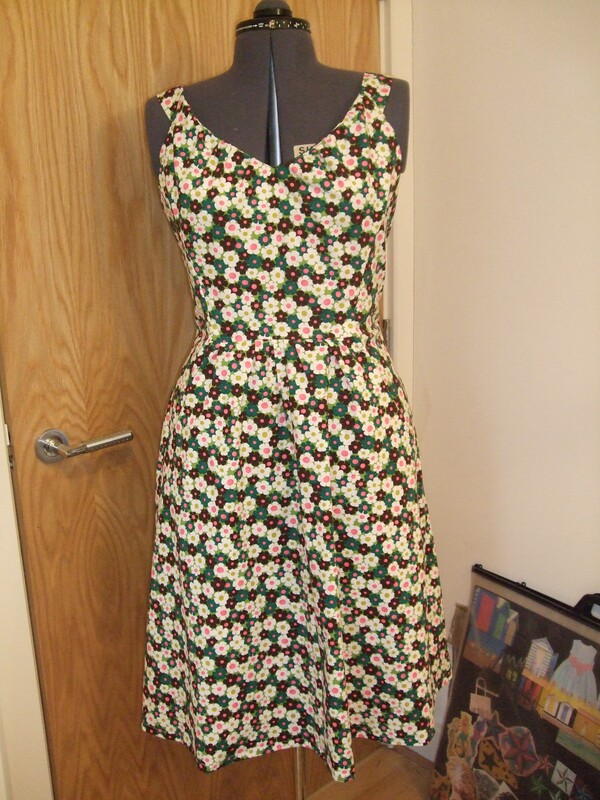 I knew I’d probably have to spend all of today working on C&G coursework rather than sewing my Parfait dress. I also knew that I wouldn’t have the car tomorrow, so anything I needed from the craft store I’d have to get today. SO… I went off to buy the things I needed, but unfortunately I was involved in an accident on my way home. It wasn’t serious (I don’t want to go into details). Physically I am fine, the other person was fine and there is no damage to the car, but I was very upset by what happened and I’ve been feeling pretty glum ever since. It’s now gone 10pm and I still have loads to do for my City and Guilds tomorrow, so I’m not going to do my two hours of sewing. I feel like I have failed my April Challenge, but I think it’s fair enough to prioritise my coursework, plus I’ve not had the nicest of days. Since the beginning of my challenge there have been a few days where I have sewn for longer than two hours, so if I’m allowed to build up sewing-time credit, I’m taking it today. I think you are totally allowed to build up credit in advance! Hope you are feeling a bit better now, and the City and Guilds went well.